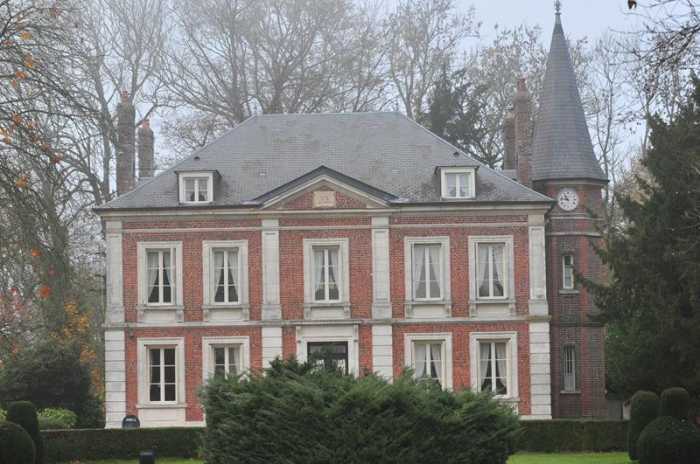 Properties for sale in Normandy, France - AHIN-SP-001129 Pont Audemer 27560 Elegant 18th Century Château with chapel and outbuildings in grounds extending to 7.5 acres in the Eure area of Normandy. The property was re-constructed in 1834 and has been completely renovated by the present owners over the last 19 years. In 2006 the roof was replaced and the building was insulated, 4 microstations were fitted for drainage with 3 sand filter beds. The ground floor is single glazed but the first and second floors are double glazed. The land has all been drained and the cabling is underground, including provision for electric gates. On the second floor there is a self-contained apartment with 3 bedrooms. All rooms are spacious with high ceilings and large windows. Viewing is highly recommended. Study 4.01 x 3.77m 2 built-in cupboard – one housing electrics. 2 windows to south elevation. Parquet flooring. 2 radiators. Marble fireplace. “Jack & Jill” En-suite Bathroom Window to west elevation. Marble flooring. Bidet. WC. Bath with tiled surround, mixer tap/shower fitment and shower screen. Radiator. Pedestal basin.